In 1999 Nishioka Tsuneo explained the concept of Uchidachi and Shidachi in traditional martial arts. In his article Nishioka puts a strong emphasis on the correct understanding of those two different roles in training. As these concepts are preliminary for understanding the techniques we are reprinting a copy of the article here. Nishioka Tsuneo, Uchidachi and Shidachi, in: Skoss, Diane (ed. ), Sword & Spirit: Classical Warrior Traditions of Japan, Volume 2, Koryu Books, 1999, p. 199-207. “The following text has as its core a translation of a chapter in Nishioka Tsuneo’s book Budo-teki na Mono no Kangaekata: Shu, Ha, Ri (Budo Way of Thinking: Shu, Ha, Ri). Direct translations from the Japanese are frequently problematic because of the ambiguity inherent in the traditional Japanese style of essay writing. In order to clarify the author’s ideas and best present his thoughts in English, we have supplemented the original text with a series of personal conversations. 1 The result thus intentionally suggests the flavor of teachings passed down from master to disciple. Please note that in this essay, the suffixes -do (way) and -jutsu (skill or technique) are used in the Japanese fashion–that is to say, without making a precise distinction between them. The author believes that they are not two distinct entities, but different facets of a single whole. It is this whole to which he refers, sometimes as budo, sometimes as bujutsu. In places he uses terminology typical of a classical art, while at other times he uses terms usually applied when discussing modern budo. His comments are intended to cover both. Training in jojutsu, for example, has a wonderful quality because it can result in both sorts of development; spiritual growth leads to technical growth and vice versa. Development is not merely a matter of technique. However, if physical techniques are taught improperly or superficially, students will become confused. There will be even greater misunderstanding if the focus is only on the process of polishing techniques. We must never lose sight of the intent to “correct and improve the spirit.” The only way to ensure this is to study under a master teacher. In general, people misunderstand what a master teacher is. They can become confused, equating the idea of a master with that of an instructor or a senior. Unfortunately, as one’s skill level increases, so, often, does the size of one’s ego. 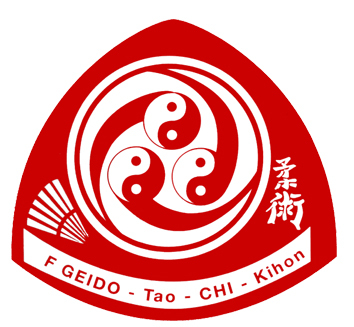 Too frequently, younger people who are of high rank or who have received a license or scroll assume that they are qualified to be a teacher just because they have instructor certification, own a dojo, or have students. It is a grave error to believe that a person is a master teacher just because of a high rank or license. Once, my teacher, Shimizu Takaji Sensei (1896-1978), told me not to copy the jo practiced by his junior fellow student Otofuji Ichizo Sensei. Unless one carefully reflects on what Shimizu Sensei really meant, this statement can be easily misunderstood. He knew that there were some differences between his way of using jo and tachi, and the way in which Otofuji Sensei used these weapons. Even in kata bujutsu,2 it is very natural for there to be differences in the form. That’s because different people have different levels of technical understanding and different mindsets. This leads them to make movements in slightly different ways and they pass on these individual characteristics in their teaching. Shimizu Sensei was afraid that young students would notice these differences, get confused or suspicious, and think that one way or the other was wrong. He seemed to have been concerned about the inevitable errors that result when a student is unable or unwilling to follow just one teacher. He urged me to follow a single teacher, to the greatest extent possible, and to avoid confusing myself unnecessarily by looking around at other teachers. Having more than one teacher can create serious problems in your training. On the other hand, insisting that students blindly “follow one and only one teacher” can result in separatist cliques and prevent students of different teachers from being able to practice together. This distasteful situation still occurs in the Japanese martial arts world. The only solution is to wait for the spiritual growth of both the teacher and the disciple; then students can train under a single teacher and still benefit from interacting with students from other groups. This is why an understanding of rei is so essential to the process of spiritual growth in bujutsu. One of the most profound expressions of rei lies in the interaction between uchidachi, the one who receives the technique, and shidachi, the one who does the technique. Unfortunately, even teachers often misunderstand the subtleties of uchidachi and shidachi in kata training. They fail to pass on to their students the difference in intent inherent in these two roles. Particularly in the classical traditions, the roles of uchidachi and shidachi are quite distinctive. Each has its own unique psychological viewpoint. It is essential that this distinct quality always be maintained. I believe that the difference in these two roles is the defining characteristic of kata training. Recently, I’ve come to the realization that it is not even worth training unless both partners properly understand this. When an outsider watches kata, it appears that uchidachi loses and shidachi wins. This is intentional. But there’s much more to it than that. Uchidachi must have the spirit of a nurturing parent. Uchidachi leads shidachi by providing a true attack; this allows shidachi to learn correct body displacement, combative distancing, proper spirit, and the perception of opportunity. A humble spirit is as necessary as correct technique for uchidachi. Deceit, arrogance, and a patronizing attitude must never be allowed in practice. Uchidachi’s mission is vital. In the past, this role was only performed by senior practitioners who were capable of performing accurate technique and who possessed the right spirit and understanding of the role. Uchidachi must provide an example of clean, precise cutting lines and correct targeting, and must also convey focused intensity and an air of authority. If uchidachi is the parent or teacher, then shidachi is the child or disciple. The goal is to acquire the skills presented by uchidachi’s technique. Unfortunately, students often act as though they want to test their skills against those of the higher-ranked uchidachi. They consider this competition to be their practice. In fact, this leads to neither better technique, nor greater spiritual development, because the correct relationship between uchidachi and shidachi has been obscured. It is the repetition of the techniques in this parent/child or senior/junior relationship that allows for the growth of the spirit through the practice of technique. These days there are fewer people who can perform the role of uchidachi correctly. I believe that bujutsu evolved into budo only by maintaining the idea of uchidachi and shidachi. This idea is a fundamental characteristic of the classical bujutsu. 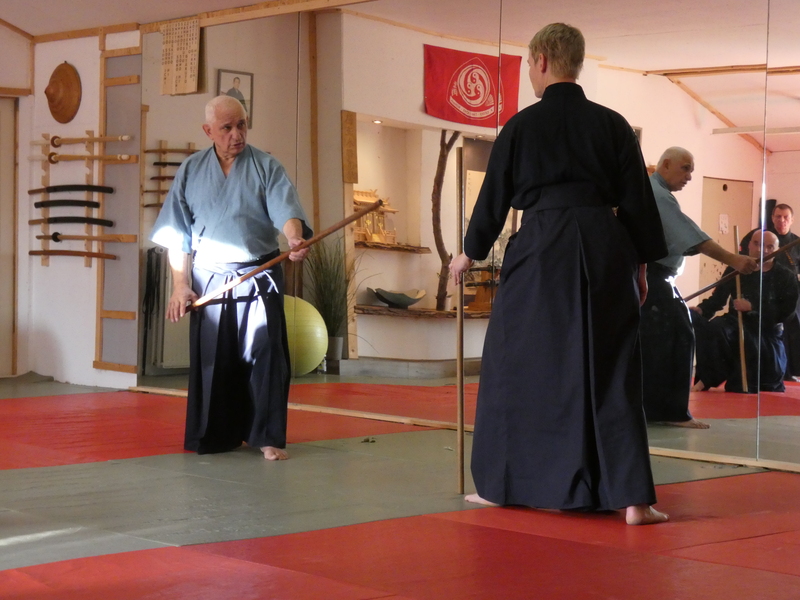 Although the Japanese arts, such as kenjutsu, iaijutsu, and jojutsu, have been transformed from “jutsu” into “do,” if the proper roles in training are not preserved, the “do” arts will veer off in the wrong direction. Obviously, there is a difference between attempting to preserve the proper distinction between uchidachi and shidachi yet not achieving perfection, and a complete lack of effort or understanding about the distinction. The existence of the intent or the quality of the intent is manifested in daily practice and actions. Those who have the eyes and experience to see can tell the difference. Shimizu Sensei always said, “You must train with me” [i.e. directly with your own teacher]. He constantly took the role of uchidachi. Even with beginners, he never relaxed his attention. He was always serious with everyone. He was never arrogant and never lorded it over another person. I believe that this attitude is the most important teaching of kata bujutsu, and Shimizu Sensei’s training was a wonderful example. This spirit is difficult to nurture, not only in jojutsu but in other situations as well. It is entirely different from a senior student or teacher showing off his skills to his juniors by treating them with arrogance and condescension. It is so easy to become trapped in a cycle of interaction that causes shidachi to react by attempting to compete with uchidachi. The guidance of a master teacher is absolutely essential to avoid this situation. I earnestly hope that everyone, particularly those who practice jojutsu, remember this axiom: “Do not be jubilant in victory; do not become servile in defeat. Lose with dignity.” This is the spirit we must emulate. This term is Japanese shorthand for old-style martial arts that are practiced using kata (see Karl Friday’s “Kabala in Motion,” Chapter 8, for a complete discussion of the kata training method) as the primary teaching tool. Unlike karate kata, in which moves are practiced solo, kata bujutsu consists of kata practiced in pairs, one attacking (shidachi) and one receiving (uchidachi). This can be done with the same weapons (i.e. tachi versus tachi) or different ones (jo versus tachi, naginata versus kusarigama, etc.). The classical Japanese arts tend to focus almost exclusively on kata-style training, while many of the modern budo incorporate kata as only one component of a larger curriculum.